When will we have the $1000 epilepsy genome? Falling prices. The initial Human Genome Project took 10 years and cost more than $3 billion US Dollars. The $1000 genome catch phrase was first used in 2001 and indicated that prices would need to fall significantly to allow for genome sequencing to be used for routine diagnostics. Currently, in 2014, the $1000 genome seems on the horizon. However, will we ever have a $1000 epilepsy genome? Genome versus genome analysis. The costs for genome sequencing are falling significantly and the $1000 genome is basically there (you may even get this for free on a collaborative research basis). 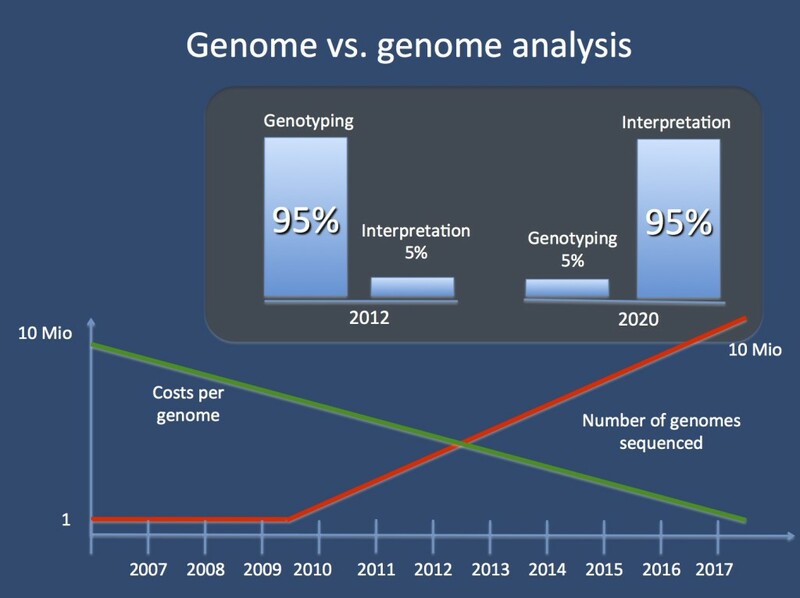 In parallel, the costs for genome interpretation are increasing. In fact, in the near future, sequencing might not be a big deal anymore – the efforts for interpretation, however, account for most of the required efforts. Technical advances. In January, Illumina was the first company to announce that their technology would be capable of sequencing a human genome for $1000. Their calculation goes as follows: with the novel HiSeq X 10 technology, a laboratory would be capable of sequencing 18,000 human genomes per year. Breaking down the price of an individual genome, this will be no more than $1000. Illumina’s announcement was breaking news, but it was far from being the earthquake that you would have expected only a few years ago. Outpaced by innovation. In 2013, the Archon Genomics X PRIZE was officially cancelled. The X PRIZE was a US$10 million competition for the first team to sequence a human genome for $1,000 or less. While this was a difficult goal to achieve in 2006 when the prize was first announced, the sponsors eventually cancelled the prize as they felt that prices were “plummeting in cost and increasing in speed independent of [the] competition” (cit). Basically, the organizers stated that the $1000 genome was on the horizon, anyway, and that a competition would no longer be an incentive. Striving for a $1000 genome was suddenly kind of boring. Technology. I am not in expert when it comes to discussing the technology behind the $1000 Illumina genome in detail, but here is how I understand the important twist behind it: the HiSeq X 10 is a combination of 10 HiSeq sequencers, combining existing technology and reducing prices by higher throughput. Who would have thought only a few years ago that it would be marketing and distribution rather than technology to push the human genome below the $1000 mark? No $1000 epilepsy genome. Let’s sit back for a second and review whether the $1000 genome is actually what it pretends to be. The $1000 benchmark stems from a time when costs for technology were still considered to be the major factor in genome sequencing. In 2014, realizing that genomic data is available at relatively low cost, we are starting to realize that interpretation has become the most expensive and time-consuming factor. You can get the $1000 genome and maybe even the $100 genome in the near future, but what are you going to do with the data? Having genomic data interpreted meaningfully in a clinical or research context will always require significant time and manpower – and the costs for this will not drop as quickly as sequencing itself. This post was approved by the ILAE Genetics Commission. This entry was posted in 2014, ILAE Genetics Commission, Opinion and tagged Archon X Prize, Celera, Complete Genomics, genome diagnostics, HiSeq, Human Genome Project, Illumina, Ion Proton, MiSeq, Oxford Nanopore. Bookmark the permalink.